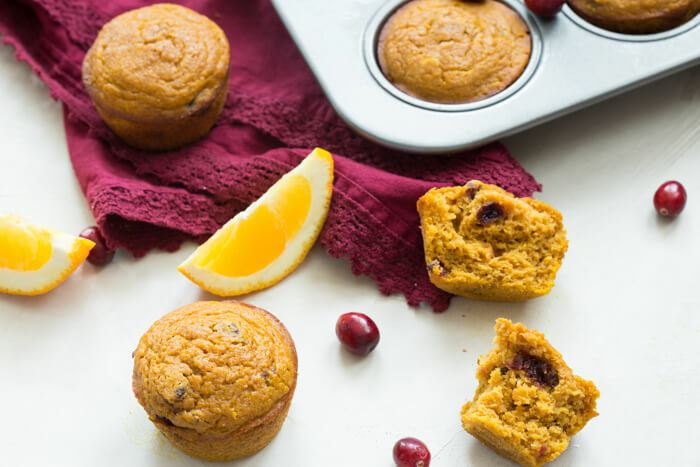 These gluten free Pumpkin Cranberry Orange Muffins are what I like to call “Morning Glory”. 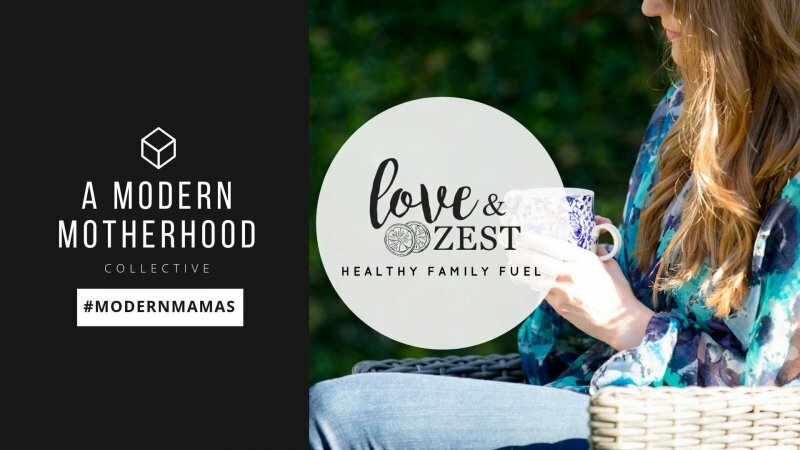 They are an early morning, warm cup of chai tea with a splash of eggnog, and a cozy-blanket-snuggle-on-the-sofa type of muffins. ANNND that may or may not be my current situation, minus the sofa snuggle because WE MOVED!!! and I sold all of our furniture on OfferUp before moving. Very good idea, but very bad idea… have you been there? Let’s just say that’s been a little stressful trying to find just the right pieces for this new space… and then realizing it can take MONTHS to get the new stuff in. WHAT?! I’m like oh…. dang. whoops. rookie mistake. 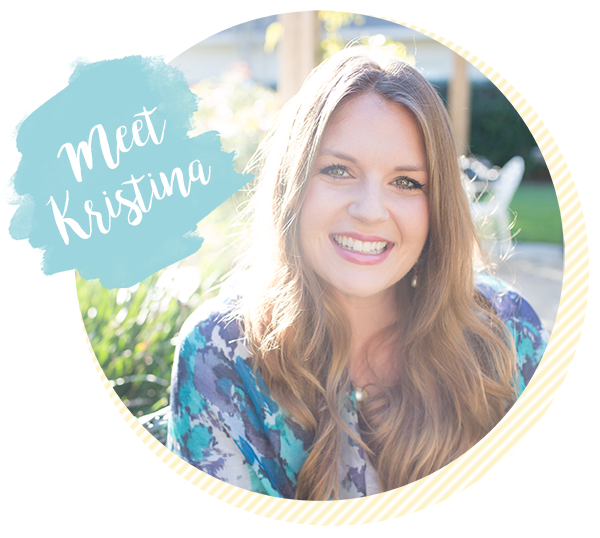 My desk should be in today so I can get my studio space more put together, so that’s why it’s been a little quiet on this blog the last two weeks. 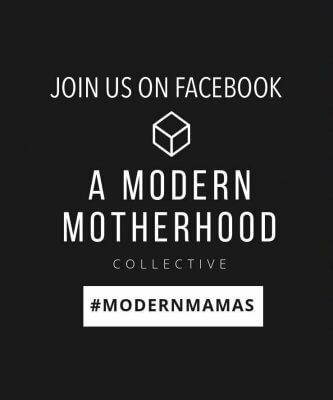 Packing and unpacking and moving and pinning all the modern farmhouse meets mid century mod things. I posted a pic of these muffins on Insta-stories last Friday hoping to get it together enough to get the recipe posted but I could only manage to get the photos edited and recipe typed up…. so thanks to my Insta friends for being patient with this mama as she get’s moved in to her new home 🙂 MUCH LOVE for you. 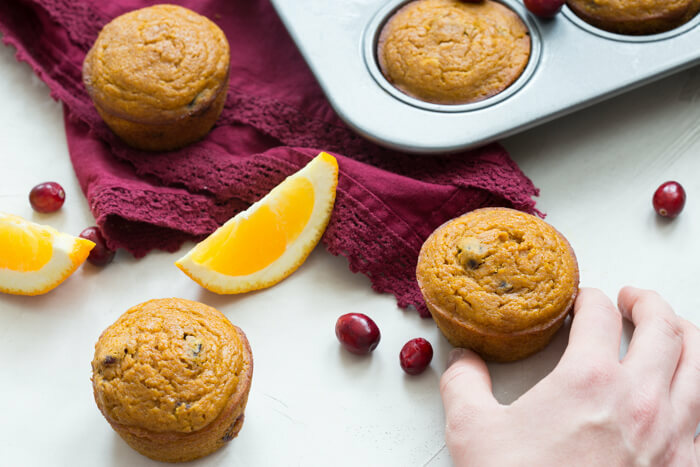 MORE deets on these Pumpkin Cranberry Orange Muffins that I love >>> they are slightly savory with sweet bursts of orange- cranberry bites that remind me of this time of year. 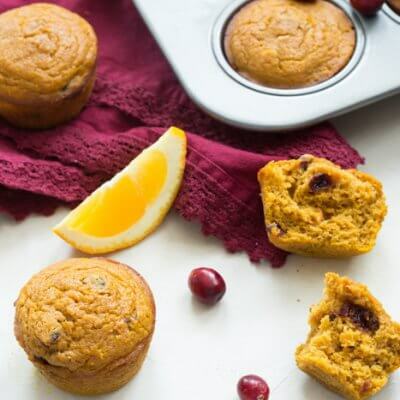 It can be hard cooking for a gluten sensitive person when the whole family doesn’t have to eat gluten free, but with these muffins you’d never know they were gluten free because they taste so yummy. Of course you can sub in regular all purpose flour or even white whole wheat (my personal fav) into these babies and they will be just as delicious. Hope you add these Pumpkin Cranberry Orange Muffins to your baking list this week! 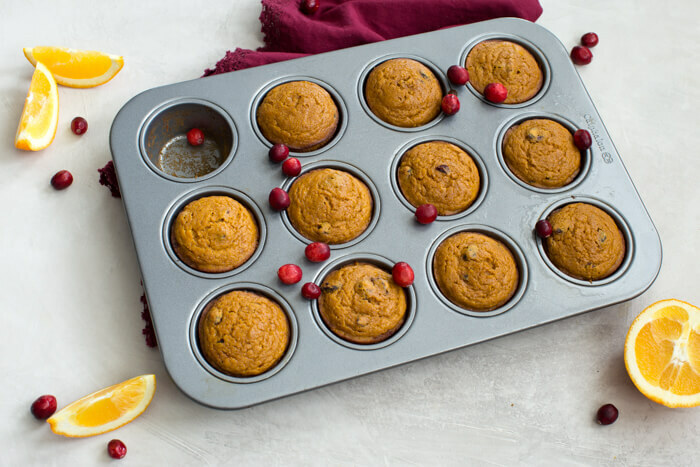 Preheat oven to 375 degrees F. Prepare muffin pans with coconut oil, cooking spray or paper liners. In a large bowl, mix together pumpkin puree and coconut oil. Whisk in eggs until combined; stir in orange juice and maple syrup. Stir in salt, baking soda, and flour until combined. Fill muffin tins 3/4 of the way full and bake for 19-20 minutes or until slightly golden and tooth pick inserted into the muffin in clean. Allow to cool for 5-10 minutes. Run a knife or back of a spoon around the edges of the muffins before removing from pan to cool on wire rack. Love that these gorgeous muffins are gluten free but don’t taste that way. Pumpkin and cranberry is a dream team combo. Good luck with getting new furniture too. 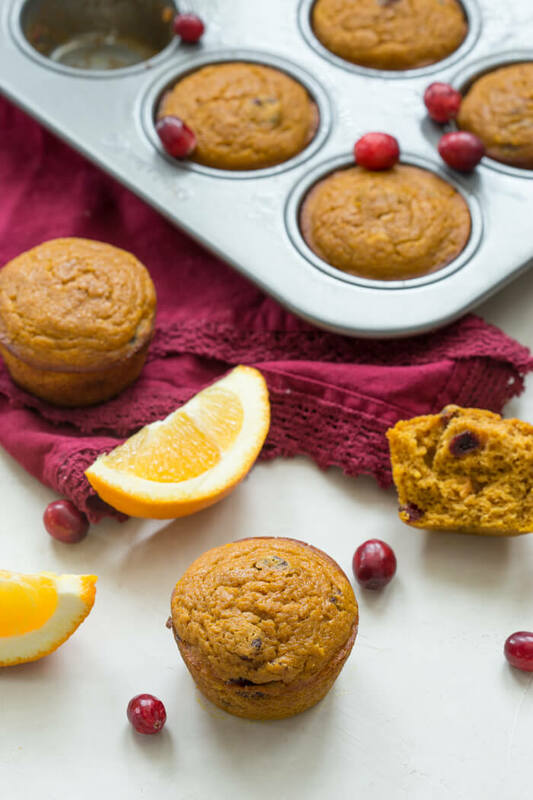 I don’t think I’ve ever seen pumpkin, cranberry and orange together – what a perfect combination! Love the fall flavors in these muffins! They look perfectly delicious! My favorite foods in one muffin. Gotta add this to our thanksgiving brunch! Trifecta of flavors I love all three and you had me at cranberry! I’ll have to whip these up soon! I am now dreaming of cuddling up on the couch with these and a cup of chai tea with a splash of eggnog, what a delicious combination! I love that these are gluten-free too, yum! Now this is reason to wake up early in the morning! Yum! I finally found fresh cranberries last week. Soooo excited. I love those tart little berries. These muffins look amazing and I bet they smell divine as they’re baking! My hubby is totally already requesting Egg Nog! I’m feeling the apple cider and chia tea but not ready to jump on the egg not train until after thanksgiving lol! But I’m ALL about these muffins!